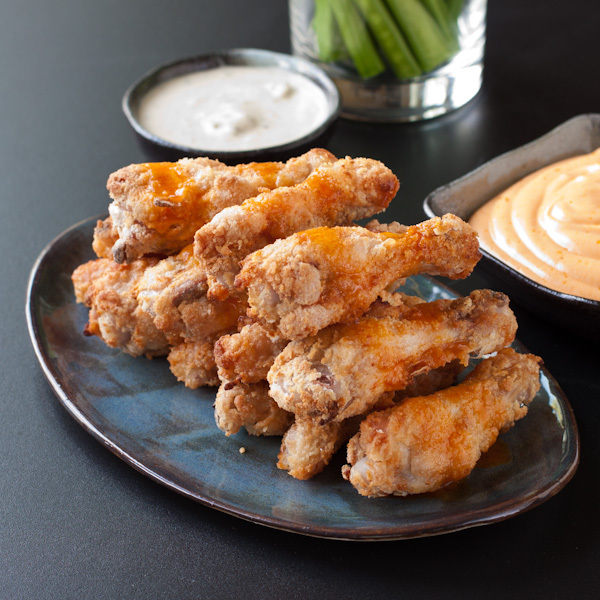 A few years ago, I came up with an inspiration for game day: vegan “hot wings.” It is THE most-pinned, most-visited recipe on this blog. Go figure! People were really missing their wings. Now that I’m eating (pastured) meat again, I decided to try making real wings, but with a paleo twist. These are grain-free, super easy to make, and I used two of Tessemae’s refrigerated sauces. Their ranch makes a perfect dip as is. Just let it warm up to room temperature before shaking. 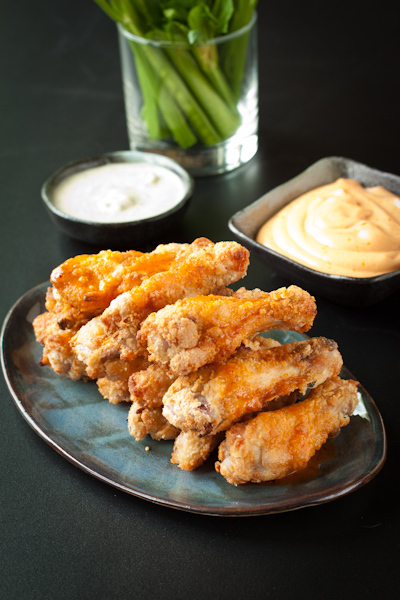 I drizzled the mild buffalo sauce over the wings (you could also toss them in it), then mixed it half and half with Just Mayo (the best eggless mayo out there). Really outstanding, and perfectly easy to make for your upcoming party celebrating that 50th anniversary big game. You just whisk the “breading ingredients” in a large bowl with a snap-top lid (or a gallon zip-top bag), then add the wings and shake until well coated. Spray or oil the racks while the oven is heating. Then bake. That is really it. Note: I did not write this post for compensation. I love both these products! Preheat oven to 425F/220C/gas mark 6.5. Line two rimmed baking sheets with parchment paper or foil. Spray or oil wire racks and set on the baking sheets (they usually fit inside the sheets, one overlapping the other). Whisk everything but the chicken together in a large bowl with a snap-top lid. Or put in a one-gallon zip-top bag, seal, and shake to mix. Add the wings to the breading and shake well to coat. Use tongs to move the wings to the prepared racks, leaving a little space between them. Spray the tops (if desired) with coconut oil or olive oil spray. Bake 18 minutes, then use tongs to flip over. Bake 17 minutes until golden on top. Flip over and if not brown enough, spray with oil and then bake another 2-3 minutes. Serve with dipping sauces. I used Tessemae's Zesty Ranch (straight) and their mild Buffalo sauce whisked about half and half with Just Mayo. These sounds so good! My other half loves wings but I’m not about frying stuff at home. Perfect solution! Thanks Laura, enjoy! They are so easy. I love that you breaded them. We usually just toss in and bake! Excellent choice on the Tessemae’s. Yum. These sound wonderful! I’m going to give them a try for Super Bowl!